Congressman John Delaney gives not-so-subtle signs of wanting to enter the gubernatorial race. He has leaked a poll that shows many undecided voters and the three current contenders with low support. Delaney took a jab at Doug Gansler for “suggesting a sensible solution on the Maryland Exchange which is the same solution we have been proposing for months” (h/t Maryland Juice). Hardly the words of someone who plans to be Gansler’s BFF. (While Anthony Brown endorsed Rob Garagiola, Gansler stayed out of the congressional race.) Josh Kurtz argues that these political feints are part of an effort by Delaney to get Gansler to leave the race, opting for the Sixth District congressional seat that Delaney would have to vacate to run for governor. Until the filing deadline, after all, nothing is truly settled so political animals can fight over the pecking order. Delaney’s entry into the race would indeed probably hurt Gansler more than Heather Mizeur but Brown has the most to gain. Delaney’s profile is similar to Gansler’s demographic and political profile. Delaney would have to work harder to attract either the hard-core progressives that are Mizeur’s base or the O’Malley supporters who have flocked to Brown. But this doesn’t work for Delaney unless Gansler exits stage west. To the extent that Brown can consolidate the African-American vote and O’Malley supporters, Delaney’s entry benefits Brown. And this matters a lot because African Americans make up a larger share of Democratic primary voters than in the overall population. Make no mistake: all candidates are working hard for both black and white votes. Gansler’s ability to attract Jolene Ivey to his ticket–a very well-liked, savvy African-American delegate with a high profile–was a real coup and Gansler has courted black voters for years. Mizeur similarly attracted first-time pol Delmon Coates who reinforces her outsider progressive message. And Brown got a great, experienced running mate in Ken Ulman who should help Brown, especially in Howard County. Having said that, a passel of white candidates seems most likely to benefit Brown and make it an uphill battle for either Delaney or Gansler. Call it a mutual political suicide pact unless one can so completely marginalize the other–unlikely–as to render them irrelevant. Delaney would likely run a strong campaign–his focused and well-run congressional race demonstrated that–and he may view Gansler as bloodied but Gansler has run twice statewide and has the funds to stay in the race. Moreover, he has passion and a vision for the state with primary day still several months away. Delaney may entice Gansler into the congressional race but that is no sure thing either for Gansler. Let’s leave aside that Gansler doesn’t live in the district–this seems oddly common among candidates for this juicy Democratic morsel. A bunch of other high profile candidates would surely also jump in the pool for that nomination. Gansler would have his sizable gubernatorial campaign fund but otherwise the same political problems. Maybe a better bet but definitely not a sure one. Meanwhile, the other candidates still have to keep an eye on Mizeur. Unquestionably, the two-term delegate is a longer shot candidate. But she is staking out the most left-wing territory–not usually a bad place to be in a Democratic primary. She is the only woman in a Democratic primary in which women invariably make up a disproportionate share of voters. And despite having less money, she is the candidate who knows the most by far about how to run a campaign. Her delegate campaign from eight years ago probably belongs in a textboo. The oblique snipe at me seems understandable (or at least unsurprising) in light of my post and earlier posts on this blog (here, here and here) calling Sam out for his changing stance on marriage equality. Regardless, I’m glad to hear that Sam was just talking large to a few people in Annapolis and for him to reaffirm his decision to exit the House. And hey, I’m now legally married and Sam is retiring. 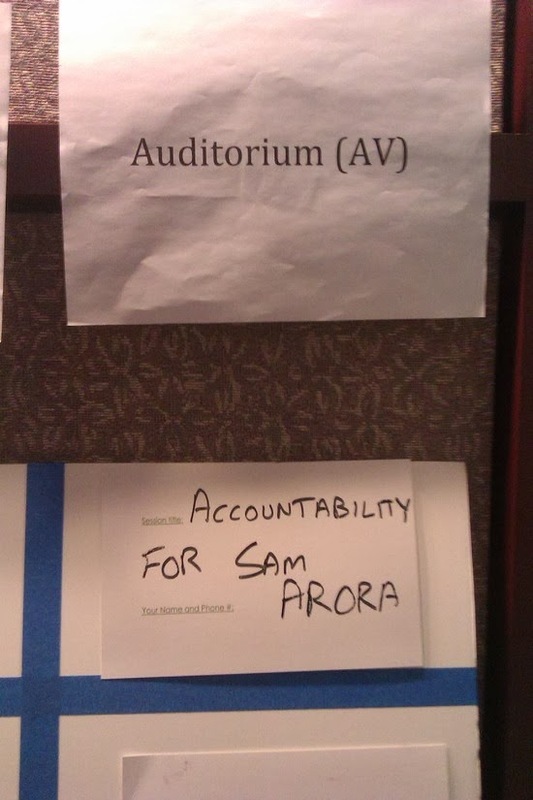 After announcing on November 1 that he will not run for reelection to the House of Delegates–most likely after having been tossed off the incumbent slate (kudos to them) and realizing that support given by many liberal groups had evaporated–Sam Arora is rumored to be reconsidering. Perhaps he thinks that the many primaries in Montgomery County will distract the locals he angered with his vote from his race. Perhaps he believes that LGBT and other progressive activists will be blindsided if he runs and have moved their focus in the wake of his retirement announcement. And We’re Back. . .
After a long hiatus, I’ve decided to start blogging again. I’m hoping to move to a new platform and URL so watch this spot to follow Maryland Politics Watch. For now, I’m not going to publish comments because I just don’t have the time or desire to moderate them. Enjoy!